Girls Ages 4 to 14 Turned Out for Free IB Girls Softball/ Lady Mariner's Softball Clinic on Monday! Free Clinic for Girls Ages 4 to 14 at the IB Girls Softball Field as MVHS Lady Mariner's Participated in Softball Clinic on Monday! 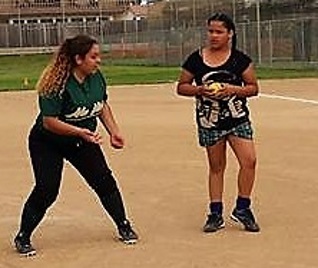 On Friday March 31st the IB Girls Softball League will join up with Mar Vista High School Varsity Lady Mariner Team to again hod a clinic for girls ages 4 to 14 at the IB Sports Park, IB Girls Softball Field at 4pm. Sign-ups are being held at the Snack Bar at the IB Girls Softball League. I would like to "thank" MVHS Coach Tracey Garcia, IBGSBL President Newt Copeland, Rebecca Webb and everyone I missed for their help with this article!